love for Barry Manilow, followed by the very strange booty texts she has received. I've done great posts on this very funny and well connected Los Angeles stand-up/casting director before. And now Lesley Wolff's (C'93, Bloomers) popular Los Angeles workshop starts up next week and you can be a part of it! If you've ever wanted to do stand-up, but were afraid, Lesley is the person to train under! I've been to several of her shows and she really knows how to bring the funny out of novice stand-ups. 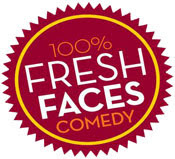 "The Fresh Faces workshop is a 5 week workshop taking you from never doing stand up to a 5 minute set at The Hollywood Improv. The class is all about finding your individual point of view and getting personal . If you have a life you're a comedian. It's a fun energized class that takes the mystique out of the daunting process of creating a set and leaves you with a slight addiction to getting up on stage. If you think you want to try stand up but never knew where to begin this is the class for you. Go to www.myspace.com/ffcomedy and check out some of the past graduates. Workshops are ongoing. To sign up for the next workshop email Lesley Wolff at Lesleywolff@gmail.com. Remember...'If anyone else can do your set...it's not your set'." And from a previous DT post, check out Lesley's advice for the actor who wants to move out to Los Angeles. "Blast from the Past" Week on DT!